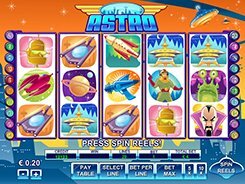 Using an eye-catching retro sci-fi artwork, NYX has produced this appealing video slot that is equipped with 5 reels and 20 paylines. The background image and the symbols depict what sci-fi authors in the 40-50s thought the future would look like, with its rockets, flying saucers, ray guns and robots. A coin size is adjusted from $0.1 to $10, with up to five coins accepted per line, thus the minimum and maximum bets are $2 and $1000 with all lines activated. The Bearded Man is a wild symbol that acts as a classic substitute for all regular icons. Besides, a wild pays out an eye-watering $50,000, for five of a kind. The Flying Saucer acts as a scatter, with 3–5 of them unlocking 10 free spins. Astro City also features the Alien Blaster Bonus triggered by three green alien symbols. You are taken to the second screen where you have to shoot aliens and earn decent cash prizes that may reach 1000 coins in total (or $50,000 on the maximum stake). With so startling a maximum bet, the slot will be very appealing for high rollers who wager big and seek for big wins. PLAY FOR REAL MONEY!